When thinking on transport for your Wedding there's lots on offer from the romance of a a traditional vintage car to something a tad more bling like a strecth limo or Hummer. 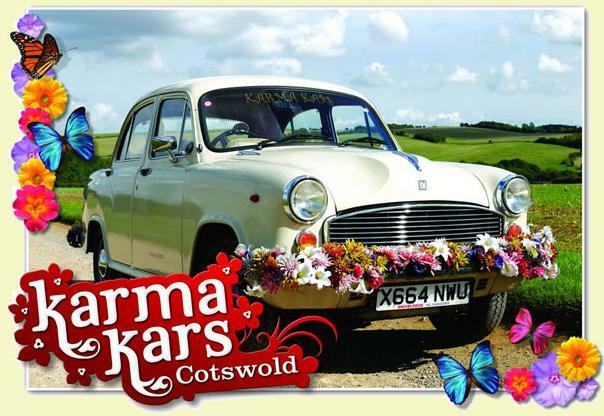 However if you want to try something fun and unique, how about a Karma Kar? Karma Kars have imported traditional Indian Ambassadors. They arrive to take you to your ceremony with both bumpers beautifully adorned with flowers, which makes a refreshing change from the traditional ribbon. The sumptuous interiors are lined with shimmering red and gold fabric that glistens on a sunny day and makes a fabulous backdrop to any photos taken in the car. To find out more visit their website or email Suzie form Karma Kars here.